This chocolate French silk frosting is so pretty on a cake and tastes even better. 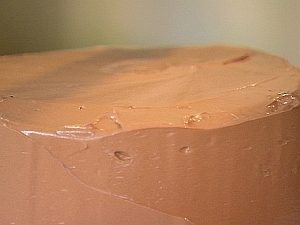 My recipe for chocolate frosting is easy - you can whip it up in no time. Your friends and family will love this. No kidding. I hope you have a stand-up mixer - because this gorgeous recipe requires a lot of mixing to achieve the ideal consistency. So worth it. Cream the butter and sugar until light and fluffy (make take up to 3 minutes). Add the cooled melted chocolate and vanilla; beating until smooth. Add the eggs, one at a time, beating for FIVE minutes after each addition (yes, 5 minutes). Chill before spreading on the cake.